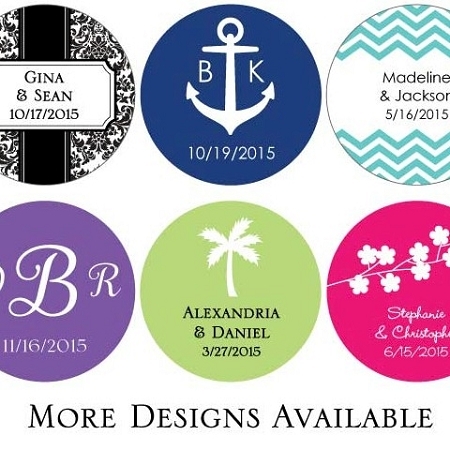 Our round labels can be customized with names, dates or a special message, such as "thank you" or "save the date." 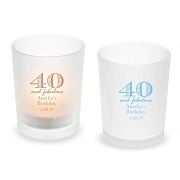 These versatile labels are great for a wedding, shower, or party. Use them as closure stickers for candy bags at your candy buffet, to secure napkins around utensils, or simply as favor tags to personalize favor boxes and bags. Add a monogram or message to wedding programs, recipe cards for a bridal shower, stationery for your thank you notes, and more! 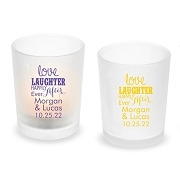 They are just the right size to cover the label on mini bottles of your favorite liquor - perfect for a bachelorette or an engagement party favor. With a little creativity, there are a lot of uses for this popular sticker choice. We believe it's the little touches that wow guests and make your event memorable, and personalization has the power to elevate favors from unique to uniquely yours! 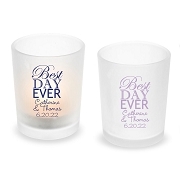 Whether you’re preparing for your wedding, birthday party, baby shower, or any celebration in between, your style will shine with these personalized stickers.